1. Toast your sesame seeds in a dry frying pan over a high heat. It should take about 5 minutes and the seeds will start to pop when they are ready. Toss the seeds to ensure they don’t burn. Take them out of the pan and reserve in a bowl. 4. Heat a wok or large frying pan over a high heat until really hot. Add the sesame oil and stir-fry the garlic, ginger and salad onions for 2 to 3 minutes. 5. Drain the noodles when cooked and rinse in cold water until the water runs clear. This stops them cooking further and sticking together. 6. Add the mushrooms to the wok then pour in the dressing. Cook for 2 minutes so the mushrooms absorb the flavour of the sauce. 7. Add the noodles to the wok, and turn the heat up to high. 8. 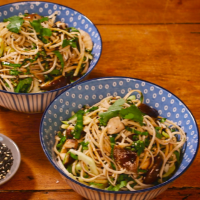 Stir through the Pak Choi and toss in half the toasted sesame seeds. Cook for a further 2 minutes on a high heat. Garnish with coriander and the remaining sesame seeds to serve. This recipe was first published in Wed Jan 06 10:20:00 GMT 2016.